Figure 1: Imaged is a small segment (10 x 10 mile) of the Arctic Ocean seafloor showing fault uplifted high mountains (red and yellow), volcanoes (bluish circular mountains), and fault down-dropped low valleys (purple). These geological features are part of the 2,500-mile-long Mid-Arctic Rift System which is known to continuously expulse heat and chemically charged/heated seawater into the overlying ocean column. New research studies and recent geological events greatly strengthen the contention, as per previous Climate Change Dispatch articles, that anomalous Arctic Sea Ice melting is fueled by geological seafloor heat flow, not man-made atmospheric Global Warming (see here, here, here, and here). These research studies, conducted by reliable institutions, prove beyond any reasonable doubt that anomalous Arctic Sea Ice melting involves a complex interaction process between many natural forces, not just atmospheric forces (see here, here, and here). This is a major setback for climate scientists and politicians advocating man-made atmospheric global warming. Turns out that the poster child and supposedly 97% resolved a portion of the theory which states human CO2 emissions are the singular cause of anomalous Arctic Sea Ice melting is—in the vernacular—a lot of hot air. This article will provide information demonstrating that natural geological heat flow, specifically geologically induced seafloor heat flow and chemically charged heated seawater flow, is actually the dominate natural force causing Arctic sea ice melting. Information substantiating this contention falls into three categories: Seafloor Geological Heat Flow Engine, Ocean Column Warming Process, and Recent Geological Heat Flow Events. In a general sense, Seafloor Geological Heat Flow Engines are the machines that provide the force to move entire continents and giant seafloor pieces one to two inches per year (Continental Drift/Plate Tectonics Theory). These machines are associated with and fueled by major segments of deep-reaching faults/breaks in Earth’s outer crustal rock layers. These faults/breaks form the boundaries between major pieces of Earth’s outer crust such as continents or ocean floors. Individual faults can be five to 15,000 miles long and harbor multiple Geological Heat Flow Engines. When a specific Geological Heat Flow Engines kicks into high gear/heats up it acts to move continents or giant ocean floor pieces around or squish them together. Seafloor Geological Heat Flow Engines are widely accepted as the most powerful entities on Earth because the back-of-envelope calculations clearly prove that the of force needed to move an entire continent is absolutely staggering. Nothing comes close to comparing. However when it comes to the exact details of how these geological machines function scientists are in the dark literally and figuratively for two reasons. First, most of these engines are present in the most remote and difficult to access portions of planet Earth, specifically super-deep ocean floor regions or the base of massive polar ice sheets. It is only within the last few years that unmanned, very stout robotic systems could capture data in these remote areas and harsh conditions. To date, this limited data has shown, as expected, that Seafloor Geological Heat Flow Engines are extremely powerful entities. Secondly, advocates of man-made atmospheric global warming insisted for many years that Seafloor Geological Heat Flow Engines do not have enough power to alter Earth’s oceans, thereby affecting its climate. They base this contention on outdated consensus climate science dogma and supposedly sophisticated state of the art computer climate models. As will be discussed several times in this article, modern research proves that this old school dogma and the supporting computer climate model results are incorrect. Even given these problems and failures the consensus climate science community has still chosen to limit research funding of Seafloor Geological Heat Flow Engines. Unfortunately, this bias has dramatically slowed the process of understanding them. This man-made global warming “atmospheric bias” is difficult to reconcile especially knowing that all other branches of science do not operate this way, for instance, astronomy. Astronomers often define and accept the presence of major deep-space phenomenon on limited data. History has shown that many of this phenomenon have been proven correct and greatly advanced the science of astronomy. Taking this mindset to heart, when Seafloor Geological Heat Flow Engines is fully understood, and therefore properly appreciated, it will prove to be one of the most important scientific discoveries in history. A discovery, or better yet, a revelation that will prove Seafloor Geological Heat Flow Engines are the driving force behind many anomalous climates and climate-related events as per the Plate Climatology Theory. Now on to details of how the specific Arctic Ocean Geological Heat Flow Engine works. The force driving this breakup process is the powerful and intrusive movement of hot molten lava from deep within Earth, upward along the entire vertical extent of faults and fractures associated with the Mid-Arctic Rift System. This frequently occurring forceful intrusion of hot molten lava acts to progressively push the giant pieces of the Arctic Ocean floor farther and farther apart. 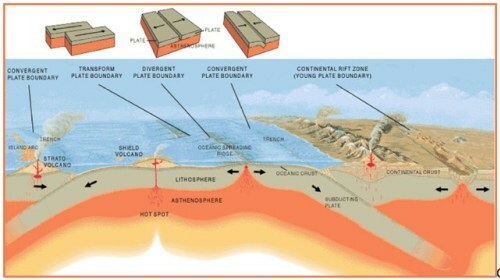 In the geological jargon, it is termed a “Divergent Plate Boundary” (see Figure 2). Figure 2: Image illustrating a “Divergent Plate Boundary”, including the upward intrusion of hot molten lava (credit NOAA). To date, the consensus climate science community has greatly underestimated the importance and power of the Mid-Arctic Rift System and its associated Geological Heat Flow Engine. These folks have in past, and still, in large part today, insist that the Mid-Arctic Rift System is a non-climate influencing geological entity. Well, once more this aspect of man-made atmospheric global warming Dogma has been proven incorrect. Extremely seismically (earthquake) and volcanically active (see here, here and here). Constantly emitting massive amounts of heat and methane into the overlying ocean from numerous segments. For brief time periods, immediately after selected significant earthquakes, the Rift pulses massive amounts of heat and methane gas into the overlying ocean. After one such event, NASA methane reading satellites recorded a large methane gas surge in the atmosphere above the Rift (refer to Recent Geological Examples here, and here). An interconnected network of varied seafloor geological components; volcanoes, faulted mountains, faulted valleys, fractured rock layers, etc. (see Figure 1). A giant seawater circulating system that captures, heats, chemically charges, and then expulses staggering amounts of seawater into the overlying ocean. (see here and quote below). Here results turn current scientific findings on the functioning of ultra-slow mid-ocean ridges upside down: Schlindwein and her Ph.D. student Florian Schmid found that water may circulate up to 15 kilometers deep in the young oceanic lithosphere, i.e. the earth crust and the outer part of the earth mantle. If this water comes into contact with rock from the earth mantle, a greenish rock called serpentinite forms. Even small quantities of ten percent serpentinite are enough for the rock to move without any earthquakes as if on a soapy track. The researchers discovered such non-seismic areas, clearly confined by many small earthquakes, in their data. Until now, scientists thought that serpentinite only forms near fault zones and near the surface. “Our data now suggest that water circulates through extensive areas of the young oceanic lithosphere and is bound in the rock. This releases heat and methane, for example, to a degree not previously foreseen,” says Vera Schlindwein. Acting to enhance Phytoplankton blooms (see here). Acting to alter marine animal migration patterns (see here). Melting ancient/prehistoric Arctic sea ice masses. Research studies of ancient Arctic area fossils, marine sediments, and rock layers also show that the Arctic sea ice has anomalously melted on numerous occasions during the past million of years. (see here, and here). Obviously, there was no human influence during these ancient time periods, and therefore geological heat and chemically heated seawater flow are the likely causes of these ancient melting events. Part of the worldwide complex of many geological heat flow engines that have in past acted together to start and stop entire Ice Ages. Research by Cambridge and others (see here and here) has shown that the end of major Ice Ages coincides with major pulses of volcanic activity. Although these researchers did not conclude that heat flow from this volcanic activity was the direct cause of his melting, it is the most logical possibility. Keep in mind that 80% of Earth’s volcanoes, approximately 15,000, reside on our ocean seafloors. Only a few of these geological features are monitored, except on rare occasions as exemplified by the Cleft Segment Mega-Plume Heat Flow Event (see here). Another longstanding tenet of the global warming theory is that Earth’s oceans are like giant stagnant bathtubs filled with multiple layers that rarely mix with one another, especially the Deep Ocean layer. Supposedly this Deep Ocean layer is a “keeper” that prevents volcanically heated seawater from reaching the ocean’s topmost layer. Consensus climate dogma also states that the mid and upper layers of the ocean act like lids, preventing superheated seawater from rising to the ocean’s surface and influencing climate and climate-related events. Turns out this is not correct. Differing ocean layers frequently do mix together, including upward-rising heat and chemically charged heated seawater from the Deep Ocean layer. This ocean layer mixing is proven to alter Earth’s climate and climate-related events (like El Nino and La Nina). This also changes how we should think of Earth, a planet whose surface is covered by over 70% seawater. A recent example of how the ocean column warming and mixing processes work was the discovery of Arctic Ocean Hotspots.These features are tall vertical columns of unusually warm seawater that extend upward from the seafloor thousands of feet to the ocean’s surface, a limited geographical surface area, fixed/non-moving, associated with massive swirling upward moving turbulence, and many sitting directly above the Mid-Arctic Rift/Fault System. It is highly likely that Arctic Ocean hotspots are geological in origin and part of Seafloor Geological Heat Flow Engines. “Our instruments are seeing billows of turbulence that look just like a wave breaking on the beach, but much larger,” MacKinnon said. “As a result, heat is being mixed up towards the surface, and the remaining ice, at a remarkable rate. While we hypothesized, this might be happening, we have been genuinely thunderstruck by how incredibly strong the turbulence is below the surface. This heat is likely playing a substantial role in the melting of the ice that we can see all around us, growing thinner every day, and our job now is to distinguish summer melting from longer-term change.” (see here). A recent and very telling Arctic Ocean seafloor geological heat flow event involved the occurrence of a small circular ice free hole on or about October 11, 2015 (Figure 3). It developed in a very short time (15 to 20 days), was in a limited geographical area, occurred in the thickest/center portion of the sea ice, and most importantly was positioned directly above an active, heat-emitting seafloor volcano that is part of the Mid-Arctic Rift System. This anomalous melting event is likely the result of a massive heat and heated methane-charged seawater pulse/eruption from a single seafloor volcano. These types of well-known geological events are termed “Mega-Plumes“. Mega-Plumes have been observed in most major oceans, are all associated with Rift/Fault Systems, and are the focus of an entire U.S. government marine research study division, the Pacific Marine Environmental Laboratory (PMEL) (see here and here). This specific Arctic sea ice melting event proves that the Mid-Arctic Rift System and associated Geological Heat Flow Engine are fully functional. It is essentially a real-life test run/simulation that gives significantly more reliable information about, and a unique perspective of, the natural forces that control Arctic sea ice melting. This valuable information and perspective cannot be obtained by running a theoretical computer climate model loaded with only atmospheric data. Figure 3: Temperature, concentration, and salinity maps illustrating a rapidly formed and a distinct ice-free hole in the overlying Arctic Sea Ice (http://arctic-news.blogspot.com/2015/10/methane-vent-hole-in-arctic-sea-ice.html). A powerful and more widespread recent Arctic Ocean seafloor geological heat flow event occurred on March 9 and 10 of 2014. It was expressed as a significant long-linear release of methane gas into the atmosphere directly above a huge length of the Mid-Arctic Rift System as recorded by National Aeronautics and Space Administration (NASA) gas sensing satellites (see here). This world-class geological event was triggered by earthquake movements along the Mid-Arctic Rift / Fault System. These earthquake movements acted to open deep-reaching fractures along a significant segment of the Rift System, tap into inner-earth, molten lava pockets, and finally transfer the heat upwards to shallow seafloor rock layers containing frozen methane gas. The heat flow melted the frozen methane layers releasing the methane gas into the overlying ocean and eventually into the lower atmosphere (Figure 4). This process resulted in a warmed ocean and eventual release of methane gas into the atmosphere and had nothing to do with man-made activities. The event indicated that the Mid-Arctic Rift System and associated Geological Heat Flow Engine are a long, linear, and completely interconnected system that is fully capable of quickly pulsing significant quantities of heat and chemically heated seawater into the Arctic Ocean. Note that additional huge seafloor methane gas seeps exist along with other portions of the Mid-Arctic Rift System (see here). 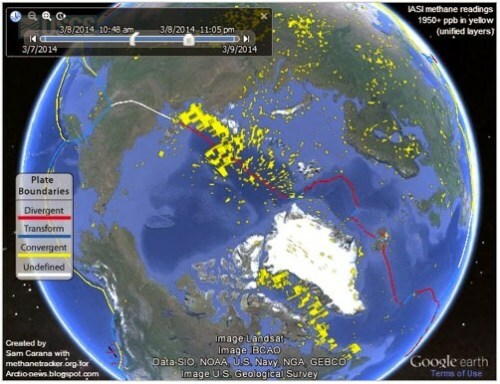 Figure 4: The massive release of methane gas (yellow blobs) into the Arctic atmosphere. blob lies directly above the West Greenland Rift/Fault System. (see here, credit Arctic BlogSpot). 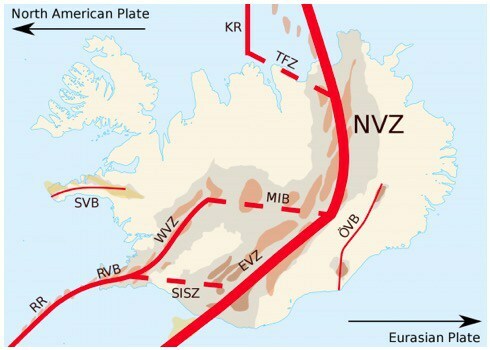 The last relevant geological heat flow event is, in short, Iceland. This small volcanic island which has been very volcanically active during the last ten years, and extremely active of late (see here, here and Figure 5). Iceland owes its very existence to the Mid-Arctic Rift System and associated volcanoes. The Rift runs smack dab through the middle of this small volcanic island. Modern day increases in volcanic heat flow and geothermal hot spring activity on Iceland are an excellent proxy for heat and heated fluid flow activity in the deeper and unmonitored reaches of the seafloor portion of the Mid-Arctic Rift System. and fault associated active volcanoes (dark brown areas). The basic problem with the global warming theory from the very beginning, and still in large part today, is that it incorrectly assumes Earth’s atmosphere is the overwhelming and dominant driver of all anomalous climate and climate-related events. A growing body of evidence shows that this assumption is incorrect and that other natural forces play a significant, and in some cases dominant, role in driving Earth’s anomalous: climate, weather, and climate-related events. More bluntly, it’s time to call off the dogs in global warming dogma and reinstitute a more free-thinking scientific approach of climate studies. A good starting place is to carefully consider the role natural geological forces likely play, as per the Plate Climatology Theory, in the anomalous melting of Arctic sea ice. http://www.wbur.org/npr/520104348/natural-environmental-swings-cause-up-to-half-of-arctic-sea-ice-loss man-made Global Warming advocates forced to backtrack because new research proves a significant amount of Arctic Sea Ice melting due to “Natural Causes”. http://climatechangedispatch.com/geologically-warmed-ocean-is-melting-arctic-sea-ice-not-climate-change Map of Mid-Arctic Rift/Fault System and references to geological activity along the system; numerous earthquakes, fresh seafloor lava flows, massive seafloor methane gas emissions from the fault system, etc. http://climatechangedispatch.com/geologically-warmed-ocean-is-melting-arctic-sea-ice-not-climate-change Map of Mid-Arctic Rift / Fault System and references to geological activity along the system; numerous earthquakes, fresh seafloor lava flows, massive seafloor methane gas emissions from the fault system, etc.